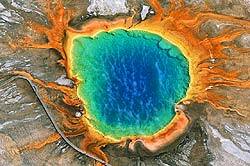 The purpose of the DEAPS 2014 trip will be to teach students basic earth science from the nature and causes of volcanic eruptions to the origin and diversity of microbial life in hot springs, to what we can tell about past climates from the fossil record. The DEAPS 2014 trip will involve flying from Boston on August 16th to Bozeman Montana. Upon arrival we will load into rental vans and begin our trip, which will involve camping and touring in Yellowstone National Park and the surrounding region. We will leave Yellowstone on the night of the August 22th and fly back to Boston on August 23th. Yellowstone National Park is roughly the size of the state of Connecticut. 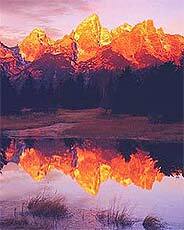 Most of the park is located in the northwestern corner of Wyoming, but small portions occur within Montana and Idaho. The park comprises primarily high, forested, volcanic plateaus that have been eroded over the millennia by glaciation and stream flow. With half of the earth’s geothermal features, Yellowstone holds the planet’s most diverse collection of geysers, hot springs, mudpots, and fumaroles. Its more than 300 geysers make up two thirds of all those found on earth. In all there are more than 10,000 thermal features, including hot springs, bubbling mudpots, and steaming fumaroles, within the park. The various geothermal features owe their origin to cataclysmic volcanic eruptions over the past 2 million years which have left hot rock and magma beneath the area. You can learn a lot more about the various stops and can see photographs from a previous year's trip here. To learn more about the overall geology of Yellowstone, try this United States Geological Survey web site. Dates: Saturday, August 16nd through Saturday, August 23th. All students must arrive on Friday, August 15th and will depart for Montana as a group early in the morning of the 16th. No exceptions will be made. Supplies: All students are asked to bring a daypack, tent and/or sleeping bag and pad. Gear will be provided for those who do not have it. On most days there will be hikes of moderate difficulty at elevations considerably above sea level. Cost: Each participant will be required to contribute $500.00 towards the cost of the trip. The Department of Earth, Atmospheric, and Planetary Sciences will cover all other costs.